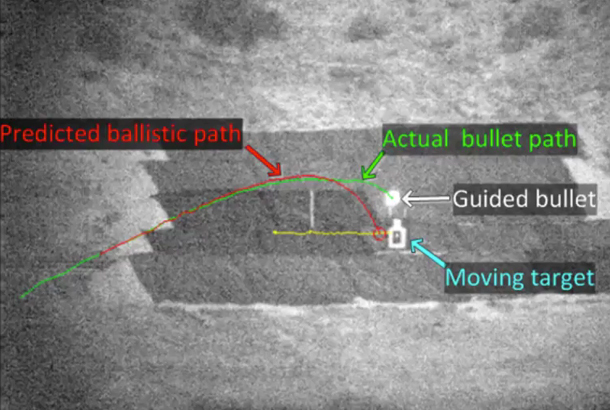 What happens when you combine ammunition with self-steering technology? You get bullets that can change direction mid-shot to hit moving targets. That’s what. If this sounds scary, it should. Researchers at the Defense Advanced Research Projects Agency (DARPA), a division of the U.S. Department of Defense, have been working on something called EXACTO, the Extreme Accuracy Tasked Ordnance program. The result of their efforts is a .50-caliber bullet that uses a real-time optical guidance system to dramatically increase hit rates for difficult, long-distance shots. DARPA’s guidance system helps track and direct these specially-designed rounds to their targets by compensating for weather, wind, target movement and other factors. Yes, that means the bullets can automatically correct their course to compensate for bad weather and even hit targets that are moving and accelerating. As you can imagine, these types of bullets could be handy for U.S. armed forces in places like Afghanistan, where high winds and the dusty terrain can make hitting targets from long distances a challenge. It can also level the playing field a bit for soldiers who aren’t necessarily trained snipers. These bullets aren’t magic but they sure do look pretty badass.